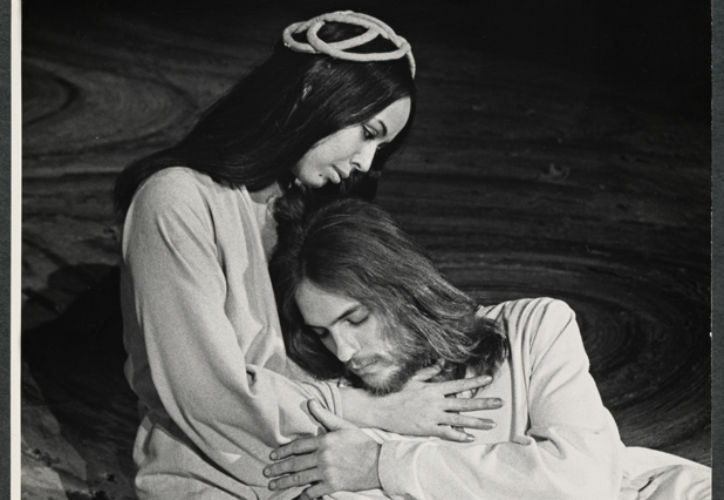 Yvonne Elliman as Mary Magdalene. Barry Dennen as Pontius Pilate. 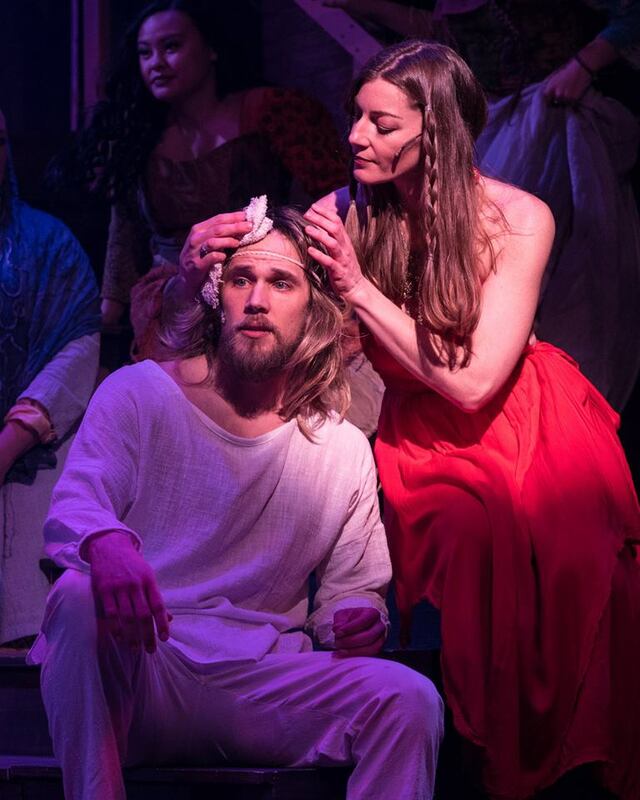 Paul Ainsley as King Herod. 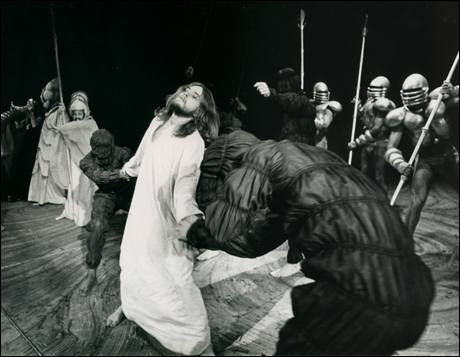 No miracles were performed on the night of October 12, 1971 at Broadway's Mark Hellinger Theatre. But for those who were there for the opening night performance of the Andrew Lloyd Webber/Tim Rice musical "Jesus Christ Superstar, it was a night of lavish surprises, souped-up staging, theatrical decadence, roaring energy, splashy performances, floating scenery and a spectacular, hypnotic rock opera score that was absolutely ground-breaking for the times...and then some. Staged by Tom O'Horgan, the celebrated director of the original Broadway productions of "Hair" and "Lenny," this "Jesus Christ Superstar" was part roller coaster ride, part acid trip, part Biblical story, part Federico Fellini, part Greenwich Village, part hippie movement, part sci-fi and part none-of-this madness makes any sense. Who knows? Maybe, that was the point. Regardless, the musical itself numbed your senses. It left you breathless. It left you hungry. And finally, it left you with a memory that you would never ever forget. 47 years later, the musical story of "Jesus Christ Superstar" still surprises, excites and resonates with that same unbridled passion and energy its creators intended. But this time around, there is no floating scenery, sci-fi imagery or exploding pyrotechnics. At Downtown Cabaret Theatre in Bridgeport, this "JCS" is raw, real, honest, emotional and grounded. It is beautifully acted and sung by an amazing cast of principals, supporting actors and chorus members. Lance Gray's deft direction and smart choreography serves the material well. 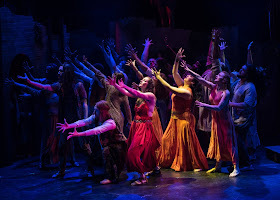 Exceptional musical direction provided by Eli Newsom no doubt would easily bring Webber and Rice up out of their seats cheering and applauding madly at both musical director and his superior orchestral team. Originally conceived as a rock opera concept album before its glitzy 1971 Broadway debut, "Jesus Christ Superstar" charts the last days in the life of the Messiah, his arrival into Jerusalem with his disciples, his interpersonal struggles with the menacing Judas, his capture and trial and finally, his crucifixion. 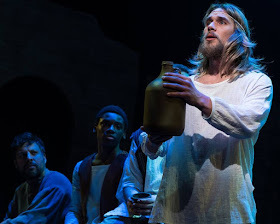 A self-proclaimed fan of "Jesus Christ Superstar" for many years, director/choreographer Lance Gray is the perfect fit for this compelling revival. 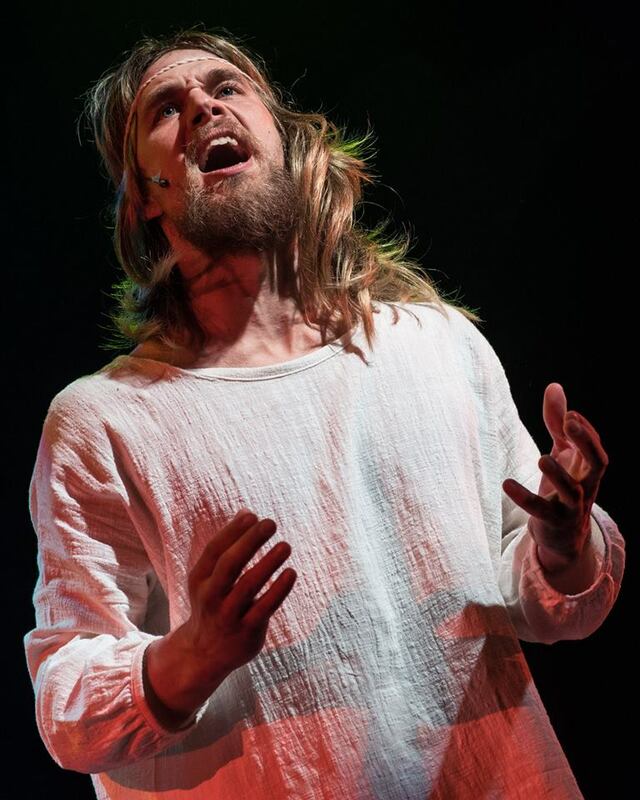 In his eyes, this is an everyman story about a man named Jesus who is a real person and hardly a superstar. 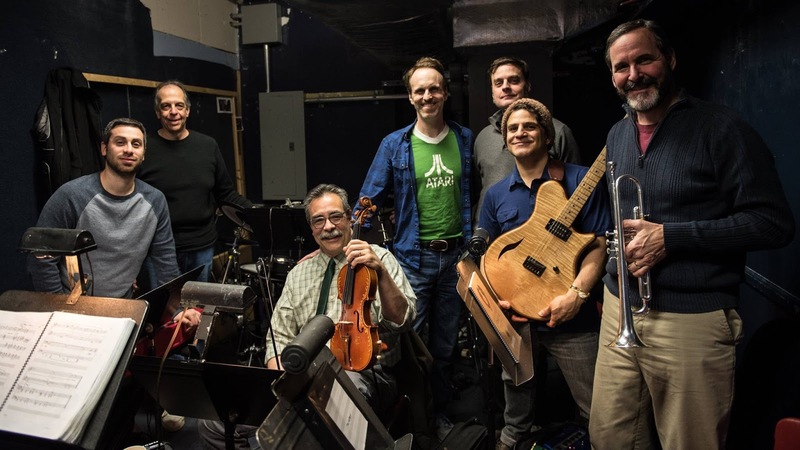 This intentional "grounding" of the musical keeps the story firmly rooted in reality without any pomp, circumstance, glitter or Tom O'Horgan madness. It's a directorial choice that allows the musical to breathe, develop and resonate naturally without any abrupt shifts in tone, style or storytelling. Even the choreography is direct and simple with only a dash or two of splash and color. At times, some of the staging shadows or suggests elements from "Hair" and "Evita" but it doesn't time travel to those periods. It remains true to the time frame of the actual Biblical story of Christ. Given the funk, hippie-era rock style of the "Jesus Christ Superstar" musical score, music director Eli Newsom showcases the musical styling of the show's past (1970-1971) without any sort or modernization, which is exactly right on all levels. This is musical from the 1970's. Its sound, its scoring, its beats, its tones, its pulses are all gob, smack and groovy from a time capsule of days gone by. That said, it's still a cause for celebration. And that's exactly what you get. As written by Webber and Rice, there's a contagious, hip, melodic and stirring beauty to the entire piece that Newsom and his orchestral team (Josh Sette, Gabe Nappi, Mark Dennis, McNeil Johnson, Charles Casimiro and Christoper Cavaliere) recreate effortlessly. Since the entire production is sung without a single line of spoken dialogue, the music never stops. One great song follows another including "Heaven on Their Minds," "Everything's Alright," "Hosanna," "I Don't Know How to Love Him," "Damned for All Time," "Gethsemane," "Could We Start Again Please?" and "Superstar," among others. The excellence of Newsom as musical director is apparent as soon as the production begins and the cast starts singing. No one hits a false note. Everyone understands their musical role in the story and the essence of the Webber and Rice music and lyrics put before them. The score is played exactly as intended with careful attention paid to its varying tempos, rhythms, potency, intensity and spiritualism. In the role of Jesus, the enigmatic Chris Kozlowski offers a genuine, honest and passionate performance that respects and honors the actual Christ-like figure he portrays. He's as charismatic as Jeff Fenholt was in the original 1971 Broadway production. He sings magnificently. And as the story builds to its eventual conclusion and things become even more unbelievably real, we actually feel Christ's pain and anguish during the flogging-whipping/crucifixion scenes through Kozlowski's piercing eyes, expressions and body language. Christian Cardozo is an amazing, forceful Judas. He also possesses a rangy, powerful and pure singing voice that makes all of his vocals sound magnificent. Carolyn Reeves offers a brilliant star turn as the soulful, often misunderstood Mary Magdalene. She too has an exceptional singing voice and brings graceful simplicity to the stirring pop vocals "I Don't Know How to Love Him" and "Everything's Alright." 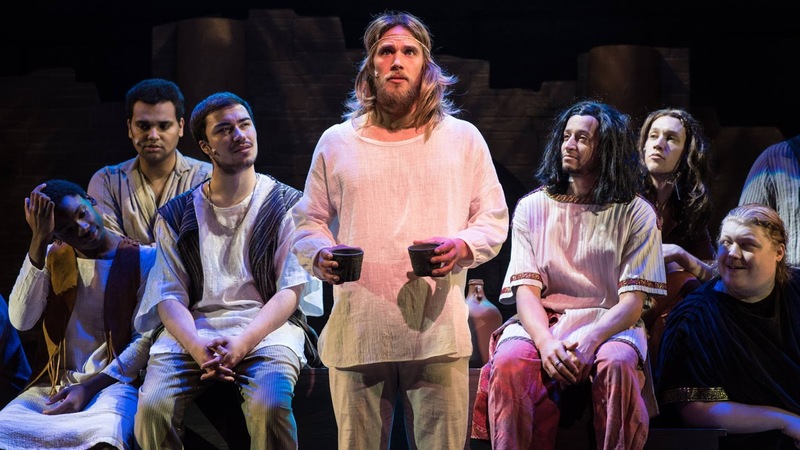 Nick Kuell is a commanding, watchful Caiaphas. 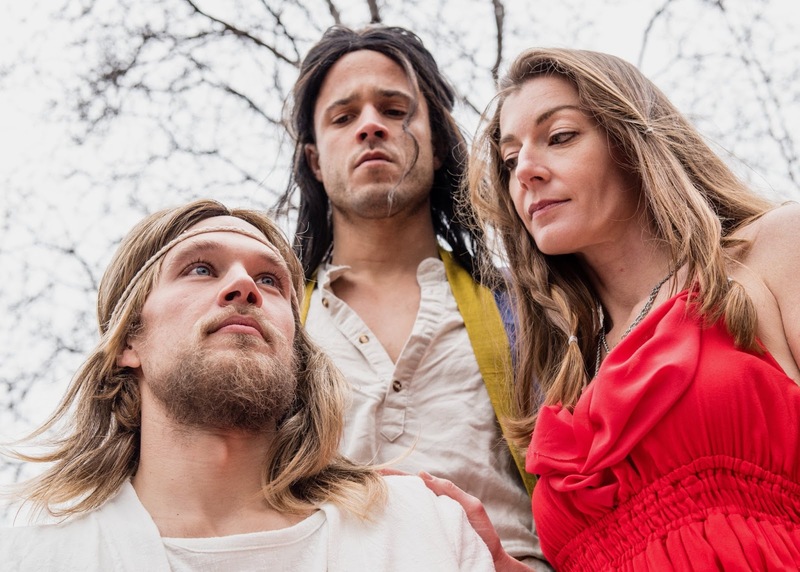 "Jesus Christ Superstar" is an intelligent, energetic piece of musical theater. It is wonderfully staged and beautifully acted. It is also an intriguing journey down memory lane for both actor and audience to experience as one. 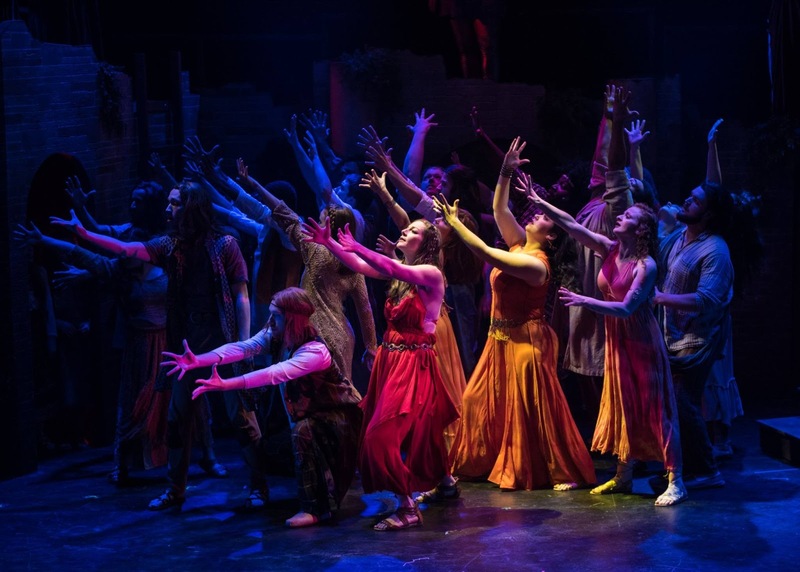 And finally, it reconfirms Downtown Cabaret Theatre's long-term commitment to exceptional musical theater entertainment including last year's phenomenal "Spring Awakening," "In the Heights," "The Hunchback of Notre Dame" and "Phantom." Plus fine dramatic works as the recent "A Raisin in the Sun." "Jesus Christ Superstar" is being staged at the Downtown Cabaret Theatre (263 Golden Hill St, Bridgeport, CT), now through April 8.